Almost nine years ago, when finances and geography combined to preclude enrollment of my children Myles and Brigid in schools in Changping, our family made the commitment to homeschooling. I have chronicled this part of our life a few times in the pages of this magazine, most recently in the 2014 School Choice Guide. Using phrases like “education adventure” to describe our approach, I have tried to keep my kids interested in learning for learning’s sake. At the beginning of this “education adventure,” I enthusiastically researched curricula and teaching methods, hoping to provide my kids the most creative, cutting edge instruction I could synthesize. I aspired to make extensive use of online resources like Khan Academy and virtual coursework. Further, paper would be banished, or at the very least severely limited, in my innovative homeschool of the future, as all work could be completed on digital media of some sort. The idea of freeing our homeschool life from the unbearable weight of paper felt like a victory long before the battle had begun. Once I was in the thick of it, actually working on educating my older child, I made a few difficult and humbling discoveries. One was that while I was able to piece together a sampler pack of educational philosophies, it would never be close to perfect for me or my son and eventually my daughter. Sometimes we would have an immediate hit, like how well my son took to Singapore Math. Other times I would flounder a bit, like my still ongoing quest for the right English grammar program. However it was my attempt to escape paper-based learning that was the most futile of my early ambitions. It seemed so diametrically opposed to my wanting to give my kids a leg-up on their 21st century lives. However, I kept returning to the efficacy of paper media over digital for certain tasks. My kids simply remember content better if they read it in a paper book rather than an e-book or webpage. The physical act of turning pages seems to help their brains process and categorize information. For learning spelling and grammar, I found copywork, out of fashion in American education since the decline of the one-room schoolhouse, to be an effective exercise for both of my kids. It doesn’t take many hand-written repetitions for my kids to be ready for the dictation test, but it still involves paper. And further in my radical departures from the high-tech education I thought I would be providing my children, I have discovered that handwriting, and cursive in particular, was much more important than I would have believed at the beginning of this “education adventure.” Cursive is increasingly out of vogue back in the US as most schools have abandoned it in favor of emphasis on keyboarding. However, cursive remains an efficient (and even beautiful!) method for taking notes, composing first drafts, and rehearsing copywork. We have not become complete Luddites, though. Some of my early techy plans have come to fruition. The kids have taken some online classes with remote teachers guiding their work, and Myles often checks ebooks out of our hometown library when our own collection is inadequate. Both kids even have been working on elementary coding as well. While they both have learned a few visual programming languages, Brigid has taken more to Logo, a textual programming language developed decades ago by the University of California at Berkeley. Like the cursive copywork that fills part of her days, her preference for Logo is a throwback to a previous century. Our “education adventure” has a clear vintage bent. 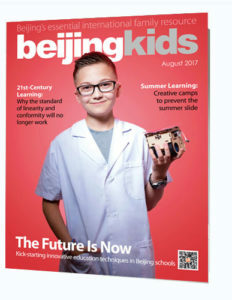 This article originally appeared on p 47 of beijingkids August 2017 issue.